One water that is starting to hit top form right now is the Two Island Pool over at Float Fish Farm Fishery. In the popular Wednesday Over 50s match Roy Wells came out on top with 111lb 1oz taken from peg 10. Wells stayed on the feeder all day and caught carp to double figures. Second with 76lb 3oz was John Final on peg three, then came Shaun Best (61lb 13oz). 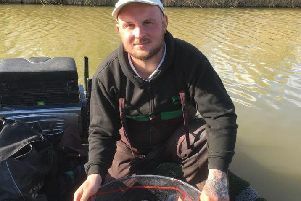 Weights were just as good for the latest round of the fishery’s summer series which saw John Hudson out in front with 105lb 2oz taken on the feeder with pellet from peg seven. Nigel Baxter was next with 88lb 6oz and then came the consistent Wells with 61lb 15oz. There is good news for all those who fish Float Fish Farm as owner Dale Hudson has begun a restocking programme which has already seen 1,500lb of fish being introduced and even more to come over the next few weeks. The new specimen pool, Lapwing, is now open to the public and it got off to a flying start with anglers reporting some very big fish and in great condition too.